“It is a question of morality and ethics: if you haven’t actually carried out this work as parliamentary assistant, we ask you to reimburse these 500,000 euro to the National Assembly and therefore to us, the French people,” the petition adds. The scandal involving the Republican candidate’s Welsh-born wife broke earlier in January. Canard Enchaine, a satirical weekly newspaper, reported that Penelope Fillon had been paid around €500,000 (US$530,000) from 1992 to 2002 from the money made available to her husband by the French government. 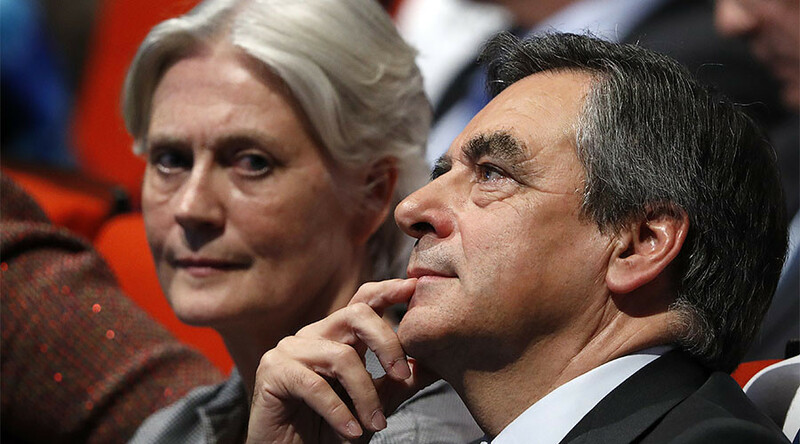 In particular, Penelope Fillon is alleged to have received her salary from funds for the Sarthe region, northwestern France, where Francois Fillon served in various positions from 1981 until 2012, and which served as his electoral base. When Francois Fillon began working under then President Jacques Chirac in 2002, Penelope Fillon also allegedly joined his cabinet, working as an assistant to Marc Joulaud, the substitute deputy MP of Sarthe (in Fillon’s absence). She earned €6,900-7,900 per month in the role, the report said. While French ministers are not prohibited from employing family members to assist them in their political careers, the issue with Penelope Fillon appears to be that one of Joulaud’s colleagues says she did not see her at work. “[I] never worked with [Penelope Fillon]. I have no information about this. I knew her only as a minister's wife,” she told Canard Enchaine. Penelope Fillon was also reportedly paid “for at least six months” in 2012 when Fillon left his post as prime minister. "In total, Penelope will have earned around 500,000 euros from parliamentary funds," the paper claimed. On Wednesday, French authorities launched an investigation into the fraud allegations against the presidential hopeful’s wife. Late on Thursday, investigators conducted a raid on the office of the Revue des deux Mondes, a monthly literary and cultural affairs magazine, AFP reported on Saturday, citing sources. The Revue des deux Mondes was also named as one of the places of Penelope Fillon’s employment by Canard Enchaine. The magazine, owned by Fillon’s friend Marc Ladreit de Lacharriere, reportedly paid Penelope Fillon around €5,000 a month between May 2012 and December 2013, though the magazine’s staff claim she never worked there. Michel Crepu, the director of the magazine, told Canard Enchaine that she was shocked. Since the scandal erupted, Francois Fillon has firmly backed his wife, saying there is no doubt she worked for him. During a rally on Sunday he made a passionate statement defending his spouse. The couple have five children and have lived together for 37 years. “They’re trying to take me down, through Penelope,” Fillon said. “But I’m not scared of anything, I’m thick skinned. But if you want to attack me, attack me from the front. Leave my wife out of the political debate!” he stated. “It’s more than me as a person that is in the crosshairs, it’s a higher idea of France that they want to take down mid-flight,” he told the crowd. The presidential hopeful said that his wife edited his speeches and represented him at events. Fillon, who won the Republican presidential primaries in November, faced a fresh scandal on Sunday as another publication claimed that he had drawn money from public funds. According Le Journal de Dimanche newspaper, Fillon “cashed seven cheques” from funds “intended for assistants” between 2005 and 2007 for "a total of around 21,000 euros." On Friday, an Odoxa public opinion poll showed that Fillon’s popularity had dropped after the scandals, with 38 percent of respondents indicating they have a good opinion of the presidential hopeful – a 16 percent drop since polls from the November primaries. Despite the controversy, little is known about the potential first lady of France, Penelope Kathryn Fillon, a Welshwoman in her 60s. She has always been very discrete and Le Parisien newspaper even called her “la femme de l'ombre” (the woman of the shadows). "At the end of this week everything will calm down and I can go back to normal. People do not recognize me on the streets and I don't want to be [recognized]. I would be terrified," she said. She rarely gave interviews to the public and preferred to stay at the family home in the Solesmes commune in the Sarthe department and raise the couple’s children, according to French media. "Up until now, I have never been involved in the political life of my husband," she said back in October 2016.